Felt Armour (2018), Mythico (2015). Smith is part of the faculty at Toronto’s Off Centre DJ school, where she teaches the foundations of music creation and technology. In 2013, she offered Toronto's first female-only hardware sampling course. The sonically adventurous stylings of Pursuit Grooves oscillate between moments of jittery tension and silky release: her chopped-up basslines, woozy melodies and improvisatory funk add up to a smorgasbord of twisted house cuts. For over a decade, she has been acclimating us to her beautiful bias for balance—light and dark, fragility and toughness—by seamlessly blending deep machine soul, dismantled hip-hop instrumentals and heavy hitting, genre-bending dub. Pursuit Grooves is the long-running musical project of Vanese Smith: an American-born, Toronto-based producer, vocalist, DJ and visual artist. Smith began shaping what would eventually become the Pursuit Grooves sound from a very early age: buying her first piece of gear at 14, collecting 12-inch vinyl hiphop instrumentals, and making music using analog synths and assorted four-track tools. She’s an alum of the 2008 Red Bull Music Academy in Barcelona, and has been showcasing her triple-threat abilities—producing, singing and rap—ever since, releasing material on Pinch’s Tectonic, Gilles Peterson’s Brownswood and her own label What Rules. She has remixed The Knife, taught at Toronto’s Off Centre DJ school and been described as “eternally underrated” by FACT. Prior to releasing her twelfth album, Felt Armour, to great acclaim this past winter, Smith had been spending the last three years building her graphic design and product line, MO:delic Arts. 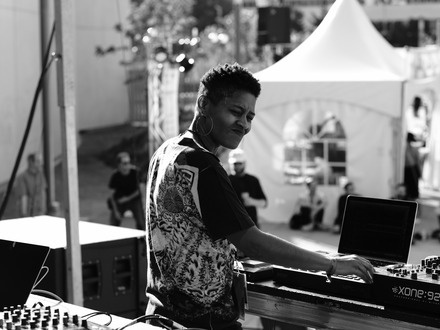 Smith has performed with her trusty hardware sampler at festivals such as Barcelona’s Sonar, Austria’s Elevate and Detroit’s Movement. For the very first time, she brings the percussive punch of her latest Felt Armour cuts to MUTEK’s outdoor stage.